Juncus marginatus. By Karan Rawlins. Copyright © 2016 CC BY-NC 3.0. www.bugwood.org: (Accessed 1/2016). 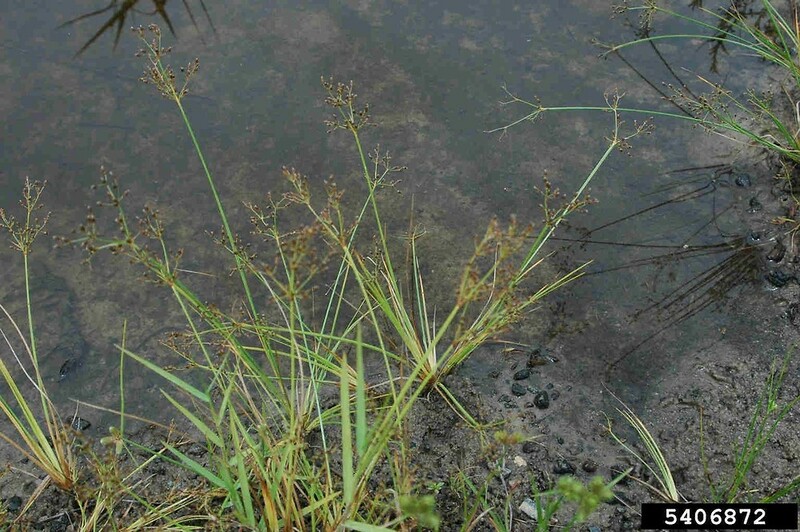 Juncus marginatus is a perennial rush, 20-50 cm tall in tussocks, stems bulbous at base. Leaves with membranous lobes at top of sheaths, blades flat, soft, the lowest leaves 4-20 cm long, 0.1-0.3 cm wide, 3-veined, inflorescence bract, 2-15 cm long, shorter to not much longer than inflorescence. Flowers 2-12, per head, each about 0.3 cm long, petals with wide, membranous margins, brown stripes along green center, tips rounded, sepals reddish-brown, tips pointed; inflorescence of 5-20 heads, to 0.6 cm wide. Fruit capsule broad, widest above middle, 0.2-0.3 cm long, tip rounded, June-Sept.
Habitat: Wet meadows, low open sites, soil pH 5.5-6.8, tolerant of fire, moderately tolerant of shade, intolerant of salt, drought (USDA, NRCS 2010).